Rugby league in 2015 is at risk of suffering rugby union's biggest blight: fans wondering why the referee blew his whistle. Coaches and players will share the confusion. A change in the interpretation of the rules for this season means there will be even more inconsistency with ruck penalties, following the uncertainty of the past few years. An off-season edict instructing all tacklers to immediately release themselves from the ball carrier means there will be untidy rucks, with tacklers strewn around the play-the-ball and dummy-half runners seeking to win penalties by colliding with players unable to retreat 10 metres in defence. Rugby league's great boast over the 15-a-side game is that its players and fans usually know why the referee blew his whistle. The myriad reasons a rugby union referee can penalise rucks and mauls has long perplexed the code's supporters, with even internationals asking each other "what was that for?". Now, both codes will have untidy rucks, with referees' interpretation influencing the outcome of games. 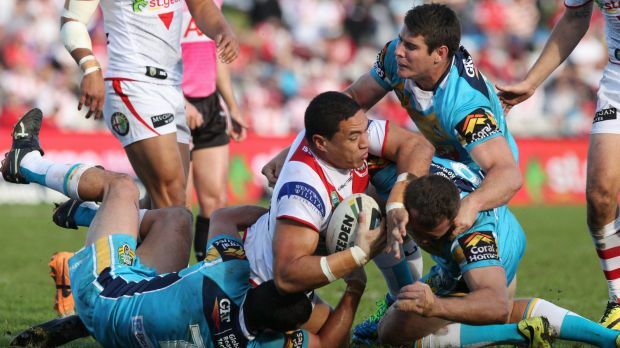 Penalties and repeat sets already produce about one-third of tries in the NRL. Last season, latitude was allowed with defenders releasing themselves in two stages, giving them time to assume positions as markers. Now, as they release immediately, some tacklers will be desperately trying to unlock their arms, others lying to the side of the ruck and most off balance as the ball is played. Not only will it result in more dummy-half running, but more dummy-half running to win a penalty. NRL head of football Todd Greenberg says referees have been attending opposed sessions at NRL clubs, with 25 sessions held over two weeks, educating players and coaches on the new ruck requirement. However, NRL coaches talk to each other and suspect that what had been allowed by one referee at say, Canberra, has not been followed in Sydney. Referees have told coaches they do not like the new ruck interpretation, with their boss, Tony Archer, a critic. They are aware they will wear the criticism for blowing, or not blowing, the whistle. "I'm confident the referees are OK about it," Greenberg said. "In fact, they have been fantastic. It's not a rule change. It's a change in the interpretation of the rule." Asked whether he agreed rugby league was headed in the same direction as rugby union, with untidy rucks and confusing penalties, Greenberg said, "We are pushing for consistency. We're driving referees for accountability. We have metrics in place to assess them. Ultimately, they are no different to players in being measured." i. Pulls the player in possession to the ground once the tackle is complete. The referee will be required to do a mental check list of these offences and, satisfied the play-the-ball was quick, will then be required to rule on possible impediments in no man's land, with players strewn around the ruck.